Happy St. Patrick’s Day from Miles Kimball. Saint Patrick’s Day was made an official Christian feast day in the early 17th century and is observed by the Catholic Church, the Anglican Communion (especially the Church of Ireland), the Eastern Orthodox Church, and the Lutheran Church. The day commemorates Saint Patrick and the arrival of Christianity in Ireland, and celebrates the heritage and culture of the Irish in general. Celebrations generally involve public parades and festivals, and the wearing of green attire or shamrocks. According to legend St. Patrick used the three leaf clover (or shamrock) to explain the Trinity. 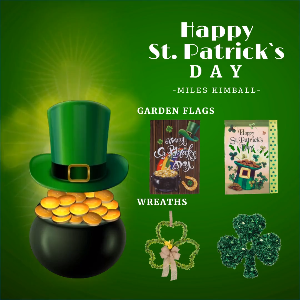 Celebrate your Irish pride this St. Patrick’s Day with everything you need for a truly festive celebration available from Miles Kimball. Everyone enjoys the luck of the Irish on St. Paddy’s Day and we’ve got just what you need to spread the luck around on this special occasion. From a fun St. Patrick’s Day garden flag to shamrock apparel, jewelry, and fabulous collectibles, you’ll find everything you need for show off your Irish heritage all year round. The fun starts in Miles Kimball’s St. Patrick’s Day department where you can stock up on playful décor and more, including lights and shamrock wreaths!